Shipping charge may increase depending on buyer's location. Additional shipping fees WILL apply to non-continental locations, or if liftgate services or expedited shipping is needed. **Call 1-800-428-9898 for more information. 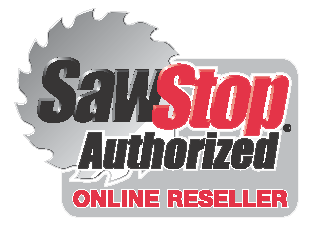 SawStop Saws are the most advanced saws in the world. Each saw is equipped with a safety system that detects when someone accidentally contacts the spinning saw blade, and then stops the blade in milliseconds. In most cases, such an accident would result in just a nick on a SawStop saw, instead of the devastating injury which would likely occur on an ordinary saw. The photo at the right shows what happens on a SawStop saw when a hotdog (representing a finger) hits the spinning blade at a speed of about 1 foot per second. A fast-acting brake stops the blade when contact is detected. The brake includes a heavy-duty spring to push a block of aluminum, called a brake pawl, into the teeth of the blade to stop the blade from spinning. The spring is held in compression by a fuse wire until contact is detected. When contact is detected, the system sends a surge of electricity through the fuse wire to burn the wire and release the spring. The spring pushes the brake pawl into the teeth of the spinning blade, and the teeth cut into the aluminum and bind, thereby stopping the blade. All this happens in about 3_5 milliseconds, or 1/200th of a second. At the same time, the angular momentum of the blade causes the blade to retract below the table and the power to the motor is shut off. Price quoted for shipping is for standard continental USA shipping only (AK & HI additional charge). If you need lift gate service, expedited shipping, or special shipping arrangements please call 1-800-428-9898 for a shipping quote. Click the button below to add the SawStop 10" Industrial Cabinet to your wish list.